The Hayward and Calaveras Faults in the San Francisco East Bay are notable strike-slip systems that can produce dangerous earthquakes. New interferometric synthetic aperture RADAR (InSAR) observations show the faults are connected at the surface and seismicity below the surface confirms the connection at depth. The connection of the two faults creates a larger fault system and raises the potential risk of a larger earthquake in a populated region. The Hayward and Calaveras faults are long and seismically active strike slip systems that are part of the plate boundary denoted by the San Andreas fault system in California. 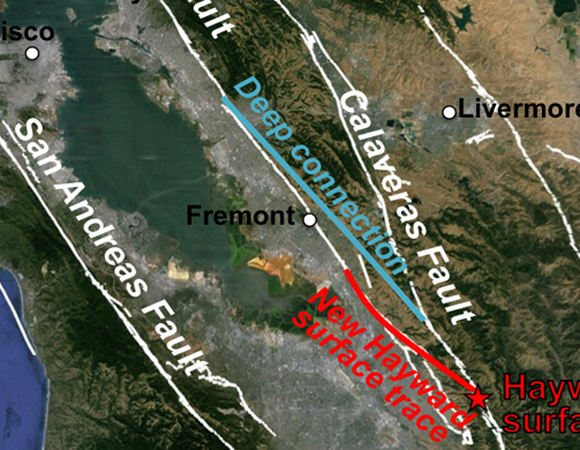 Previous mapping of the surface traces of the Hayward and Calaveras faults in the San Francisco East Bay do not show any surface intersection between these major systems. Combining more than 250 acquisitions from four tracks from the European Remote Sensing (ERS) and Envisat satellites yields an InSAR time series of interseismic deformation from 1992 to 2011. The data are from the Western North America InSAR (WInSAR) archive maintained by UNAVCO. Compilation and analysis of the InSAR data provides information about the surface extent of the faults. To determine the locations of the faults below the surface, the distribution of repeating micro-earthquakes at depth was mapped out for the period of 1992-2011. 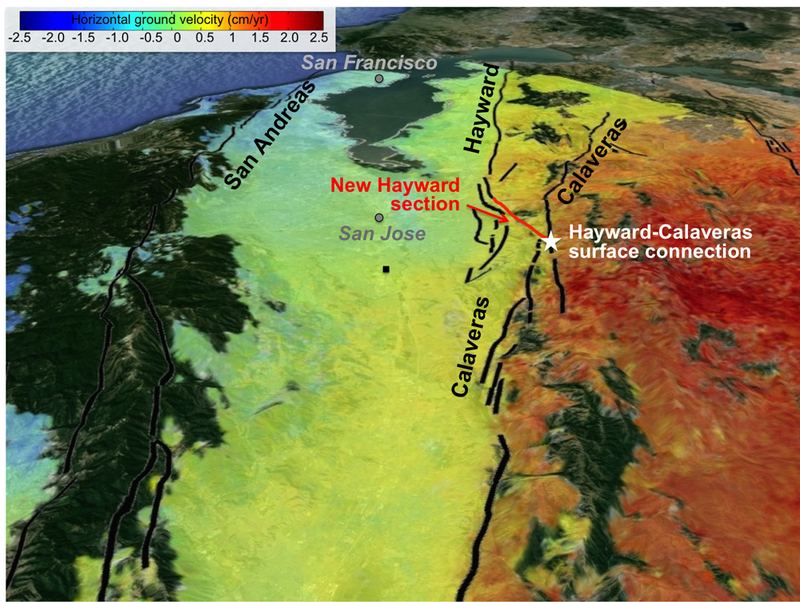 The imaging data show that the Hayward fault continues to the south another 15 kilometers beyond its known surface trace and it bends toward the actively creeping surface trace of the Calaveras fault. The seismic data shows this surface connection as well as a connection at depth. Thus, the Hayward and Calaveras faults are actually one longer and more threatening fault system. The increased length of a potential rupture means that the fault could generate an earthquake much larger than a magnitude 7 and this poses greater risks to the San Francisco Bay population. 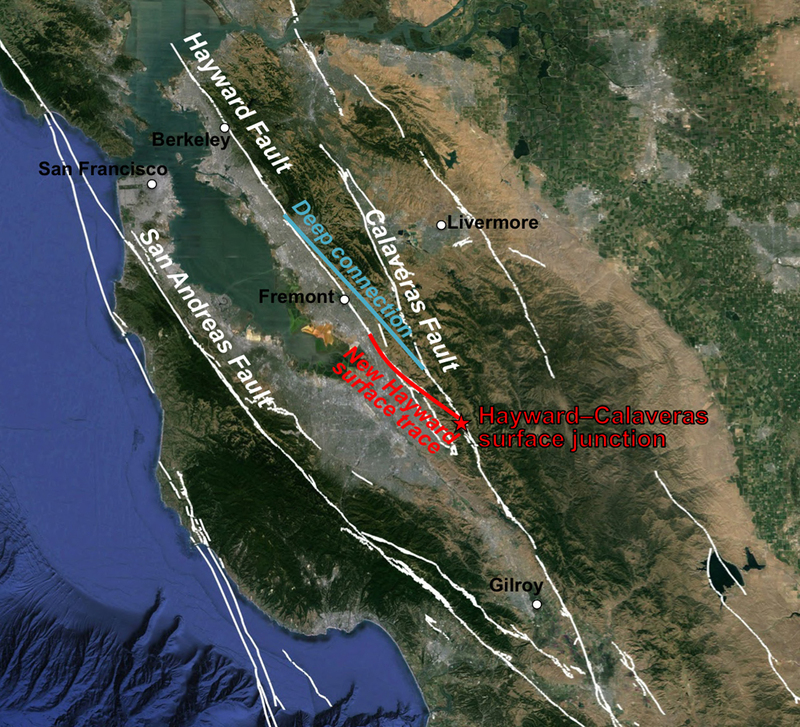 References: Chaussard, E., R. Bürgmann, H. Fattahi, R. M. Nadeau, T. Taira, C. W. Johnson, and I. Johanson (2015), Potential for larger earthquakes in the East San Francisco Bay Area due to the direct connection between the Hayward and Calaveras Faults, Geophys. Res. Lett., 42, doi:10.1002/2015GL063575.